Cute kid, plus how I intend to use this blog – Naming a blog is harder than naming a kid. Yesterday I took him out on a walk with the new wagon his grandparents gave him for Christmas. First, we delivered a pile of boxes of his old things, books and toys and clothing, to the new family a couple of doors down who have a baby. They were very grateful, and as their three-year-old is Owen-proportioned, that is huge for his age, the 3Ts and 4Ts they’re now weeding out they’ve promised to bring us for Owen. Then we wandered around the block, looked at daytime Christmas decorations, talked to neighbors and gulls, watched a worker shovel dry cement into a wheelbarrow to move to a backyard for concrete pouring, and visited the schoolyard nearby to run around and play. While we were there, we found a couple of playground balls very stuck in a little maintenance cage. 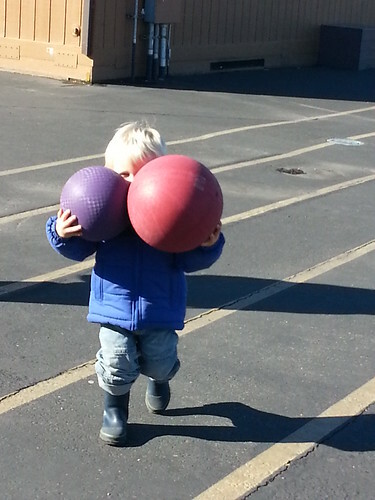 I tried to get them out the top and couldn’t, so phoned Casey, who came over and got them out with his long gibbon arms and tall tall body, and we played for a long time, leaving the balls behind at school when we came home so that very tired Owen could nap. 1. Sometimes I will have time and energy for long, pretty posts with good formatting and well-argued ideas and I will be able to respond nicely in conversations and support my assertions and all that. I expect that combination to occur once a year or so. I will get some fraction of it more often. 2. More often, I will do something like post from flickr (like now) which means not so much with the formatting and mostly photo, and I have no idea how valuable anything I say will be or how well I’ll manage to converse. 3. I intend this to be a combination of everything I’ve got, https://plus.google.com/116935304621714844901/posts, http://familyvalues.dreamwith.org, http://geographile.blogspot.com, http://mactavish.livejournal.com, my facebook account, http://twitter.com/mactavish, and http://twitter.com/geographile. Sometimes I will crosspost from here to there, or there to here. But when something either needs to be locked to private, or is only intended for a very narrow audience, I’ll only put it one of those other places. If you only want to read one type or chunk of what I write, you’d be better off one of those places. If you’re more interested in a flow of whatever I spit out, this is better. I wish it were easier to link to/from dreamwidth and google plus automagically. I have a feeling this combination of reading will lead to a blog post about food, body, disability, and eating disorder recovery and beyond….